In this post, I will show you how to download FantasyPros fantasy football projections using R. The key advantage of FantasyPros is that it aggregates many sources of projections into its predictions, which increases prediction accuracy, as I discuss here. i would like to check it out …. First off: Thanks for introducing me to R, and thanks for showing your methodology instructions. I’ve been pulling all my data by hand and, needless to say, it’s been extremely time consuming. I have a question for you about your League Settings.R file. I’m editing it for my own needs, but I noticed that you do not include a flex position. In my league, we have a RB/WR/TE flex slot. How would I add this to League Settings.R ? I forgot to mention: What about D/ST? Thanks again! It wouldn’t be too difficult to modify the scraping and optimization scripts to include kickers and D/ST. My analysis showed that those positions should be last off the board (http://fantasyfootballanalytics.net/2013/07/expected-points-by-position-rank-in-fantasy-football.html), so my focus was on the other positions. I’m very green to R…having a hard time understanding where your Functions.R and League Settings.R files are? Any help? I’ve tried several times in the past to use R & GitHub but wasn’t “Getting It”, even after watching some videos on YouTube. 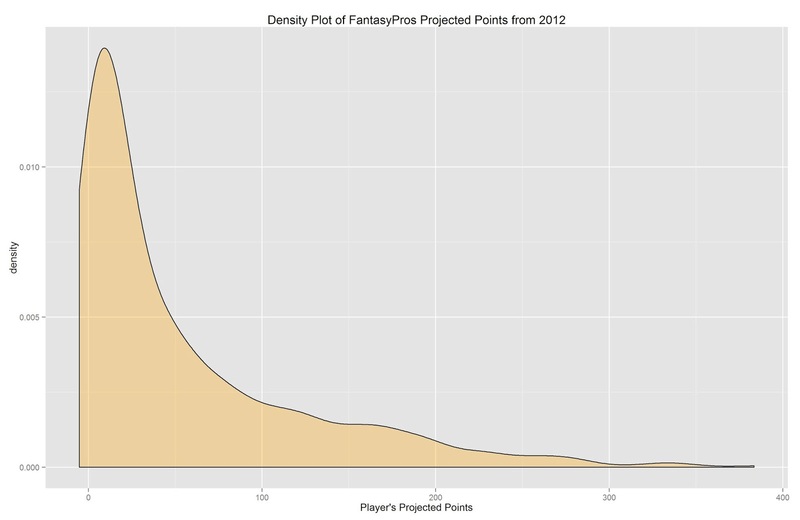 I wanted to ask you if have or if you could make a YouTube Video on how to use both as it relates to Scraping Fantasy Football Analytic Stats? I’m sure it would help not only me but many of us who aren’t as bright when it comes to that sort of stuff as well! Next story Who Has the Best Fantasy Football Projections: ESPN, CBS, NFL.com, or FantasyPros?